REUTERSShoppers walk past a Sainsbury’s supermarket in North London. British supermarket Sainsbury’s is taking on German discount rivals Aldi and Lidl with the launch of its first discount store in northern England. The Netto store, located in Leeds, is operated under a joint-partnership with Denmark’s Dansk Supermarked, which owns the Netto brand. The plan is to open a total of 15 Netto stores, with nationwide expansion in the cards if the initial trial is successful. 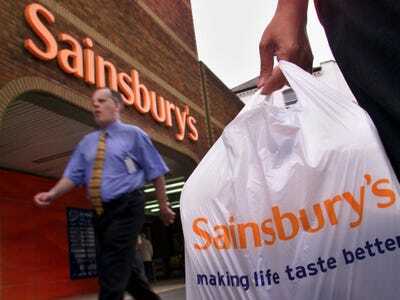 Sainsbury’s is the third-biggest grocery retailer in Britain, but it has been losing market share over the last year to discounters, whose smaller ranges of products make them more efficient and therefore cheaper. The other supermarket leaders — Tesco, Asda, and Morrisons — are also being hammered by price-cut retailers. In August, Kanatar Worldpanel reported that Sainsbury’s market share fell to 16.4%, while Aldi and Lidl picked up more customers. Sainsbury’s CEO Mike Coupe has made it his mission to revamp the grocer’s business strategy since taking over for Justin King in July. In October, Coupe told The Guardian that traditional big supermarkets were facing a “perfect storm” of challenges. “Customers have never been more savvy or shopping around more,” he said. So how do Netto-branded stores plan to kill the competition? How about a bottle of Prosecco for £5.50. Or two sirloin steaks for just £3.69. These lower prices are part of the chain’s planned weekly deals on up to 60 grocery products, including non-food items, The Telegraph reports. Each deal will last until the discounted product sells out. “We have to go head to head with the discounters,” Reuters quoted Dansk Supermarked CEO Per Bank as saying at the opening of the Netto store.